One of the things I miss most about the UK is a good pint of bitter, but recently I’ve been pleasantly surprised to find that Brazilians are also starting to appreciate the acerbic as well. 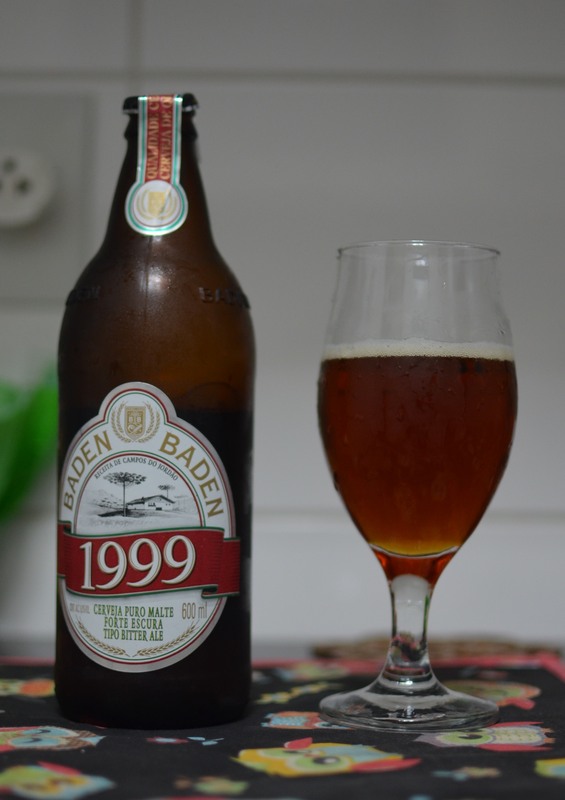 One example is Baden Baden’s 1999, which, as a UK-style bitter produced with UK ingredients, is this week’s Brazilian Beer of the Week. Where purchased: Baden Baden brewery shop. Background: See my feature on the Baden Baden brewery here. When I visited the Baden Baden factory back in March of this year I bought a crate containing one bottle of each of the beers they brew. The styles and quality vary but the one that intrigued me most was the 1999 because many of the microbreweries here in Brazil tend to be inspired by German style beers (not unsurprising given the German demographic in the south), and so it is not that common to find Brazilian brewed British bitters – in fact this was the first I’ve encountered. And how does it compare? Well, actually pretty well. It pours a dark amber colour with a good frothy white head, and strength-wise it certainly deserves its label as a Premium Bitter. As for 1999’s taste, it’s fruity and sweet but counterbalanced well with English hops, which overall makes it a very drinkable bitter. the book is on the table’s Verdict: The best British style bitter that I’ve so far encountered in Brazil, although to be fair there’s not a whole lot of competition. Sounds good. I’ll look out for this one, thanks! Found it here in BH and enjoyed it. A bit fizzy I thought and certainly ‘premium’ – maybe a little too premium for me. But I liked it a lot! thanks for the recommendation! Yeah, whilst you can now find bitters it may take a while before Brazil adopts dropping the carbonation! Their prices vary from between R$10-12 depending on which one you buy. The Golden (Ale with Cinnamon) and Red Ale (a lethal 9.2%) are also well worth checking out too. My Hubby will be pleased with my find on the net today, so thx, a lot! Now buying it in Saquarema??? maybe Rio will have it somewhere. You can get it in most of the big supermarkets here in SP so I reckon you should be able to get it there in Rio. Let me know! I will indeed, in fact hubby decided we should help you by doing lots of research on the subject, just to be helpful. :) I’ll report back. On Saturday, I went to the 2013 “Frei Tuck Biergarten” beer festival in Jardim Canada (Nova Lima, just outside of Belo Horizonte) – the centre of a large and growing brewing industry. There was a great selection of beers to try, including a couple of other British style bitters. I would recommend you look out for the “God save the Queen” bitter from the Küd brewery http://www.cervejariakud.com.br/#!beers/cqnr. I’m not sure its available outside of Belo Horizonte yet though? Added to the list! Will see if I can find, or if you’re ever down this way make sure you bring a delivery. Tomorrow is an old favourite: Colorado Indica.